Kansas auto dealers can expect to receive notifications regarding their license and bond renewal in the coming weeks. Both licenses and bonds expire on December 31, so it’s almost time to reapply for both. Below you can find answers to some of the most common questions concerning the Kansas auto dealer license and bond renewal. Which licenses need to be renewed before December 31? According to the Kansas Statutes Pertaining to Kansas Vehicle Dealer Licensing all dealer licenses, with the exception of salesperson licenses, need to be renewed prior to December 31 in order to remain active and valid. Apply for a free no-obligations quote on your bond renewal! This includes: New and used, used only, salvage, wholesale and auction dealers and others. Thе full list of dealer license types can be found on page 8 of the Kansas Dealer Licensing and Salesperson Handbook. Is renewing before December 31st necessary? Any license not renewed before December 31, along with its respective bond, is considered expired after that. In order to continue operating as a dealer, you will need to go through the whole initial application process anew. You will also need to submit all documents that are required when applying for a new license. License renewal happens through the Dealer Portal on the website of the Kansas Department of Revenue. 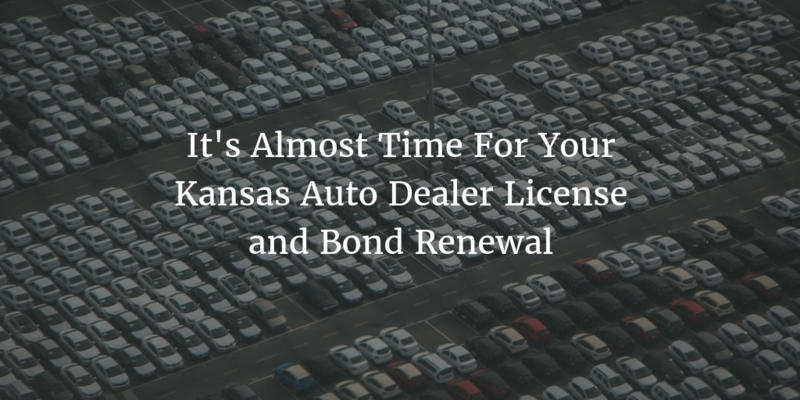 To renew your license, you must also renew your Kansas auto dealer bond at the same time. You can expect to receive a notification from your surety bond agency concerning your bond renewal well in advance – typically, 60-90 days before your bond’s expiration. The earlier you renew – the better! How long does the renewal take? It is advisable that you don’t wait to renew until the very last moment, as dealers must pass tax clearance before having their license renewed, which takes at least 24 hours. If you decide to renew on December 30 or 31 it is not certain whether you will pass the tax clearance in the Division of Taxation. If you happen not to have your tax clearance before December 31, your license will expire. You should also keep in mind that getting new plates from the tag manufacturer takes at least six weeks. License renewal fees for most licenses are $75. 1st/2nd stage converters, lending agencies and most manufactured home dealers pay a $50 renewal fee. 1st/2nd stage manufacturers pay a $225 fee and, finally, manufactured home manufacturers pay a $200 fee. All applicants must also submit a $30,000 Kansas auto dealer bond. If your credit score hasn’t changed significantly nor your overall financial status, you can expect to have to pay more or less the same premium as last year. If your credit score has experienced an improvement, you may expect to get a better rate this time around. If it has worsened or if you have had any tax liens or judgments, you may expect to pay a higher rate this time around. For detailed information about what influences your surety bond’s cost, visit our surety bond cost page. So how do I renew my bond? If you are bonded with us, you will receive a bond renewal notification with a quote early on. To renew you will simply need to fill out and sign the form and send it back to us. If this is your first time getting your bond with Lance Surety Bonds, just fill out our online surety bond application. We will then send you a FREE quote for you to review. If you want to get bonded, the remaining steps you need to take will be described in our email to you. If you have any questions or requests regarding your Kansas auto dealer bond, you are welcome to give us a call at (877)-514-5146 or contact us online.